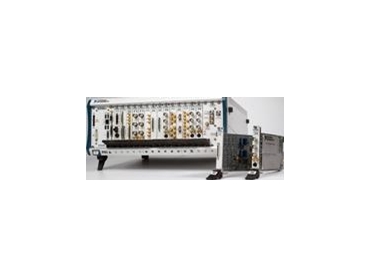 National Instruments has launched PXI Express high-speed instruments as well as the 18-slot PXI Express chassis. The new modular instruments include the NI PXIe-5122 100 MS/s, 100 MHz dual-channel digitiser and the NI PXIe-6537 and NI PXIe-6536 50 MHz and 25 MHz 32-channel digital I/O modules. The NI PXIe-1065 18-slot chassis offers up to 1 GB/s per-slot dedicated bandwidth and a combination of both PXI and PXI Express slots. PXI Express products are ideal for applications such as signal intelligence, spectral monitoring, semiconductor chip characterisation and video test. “PXI Express builds on commercial PCI Express technology to expand the applications served by the multivendor PXI standard,” said Eric Starkloff, National Instruments director of test product marketing. PXI Express instruments add to the wide range of PXI mixed-signal products from NI that include high-speed digitisers/oscilloscopes, high-speed digital I/O, baseband and RF analysers and signal generators. PXI Express instruments offer the enhanced functionality of high-speed data recording and playback using the latest industry-standard bus, PCI Express, which delivers up to 1 GB/s of bidirectional streaming throughput on an x4 PCI Express link. With the NI PXIe-5122 digitiser (based on a x4 PXI Express link), for example, engineers can capture high-speed analogue signals on two simultaneous channels at 100 MS/s with 14-bit resolution and stream the signals across the PCI Express bus at the digitiser’s full rate of 400 MB/s to the PC memory and/or hard disk. Engineers also can use the NI PXIe-6536/37 digital I/O modules (based on an x1 PXI Express link) to stream digital waveforms to and from the module at the full 200 MB/s data rate. The NI PXIe-1065 18-slot chassis complements the existing NI PXIe-1062 8-slot chassis to address higher-channel-density PXI Express-based systems. The new chassis includes a combination of PXI and PXI Express hybrid slots to accept a mix of both existing PXI modules and high-bandwidth PXI Express modules. All of the new products integrate with a variety of software including the NI LabVIEW graphical development environment, LabVIEW SignalExpress interactive measurement software and NI TestStand test management software. NI modular instruments are the building blocks for economical and versatile automated test systems. With modular instruments, engineers specify the essential functionality they require – choosing from a wide variety of measurement, signal generation, RF, power and switch modules – then configure those instruments in software for their specific measurement tasks. Because these instruments are modular and software-defined, they are quickly interchanged and easily repurposed to meet the challenge of evolving test needs. NI modular instruments are available on a variety of platforms including PXI, PXI Express, PCI, PCI Express and PCMCIA and provide the advantage of high-speed test execution by harnessing the power of industry-standard PC and advanced timing and synchronisation technologies.